The International Space Station is a maze of modules filled with racks, cables and experiments running 24/7. Upgrading and shifting units from one place to another becomes a tricky task in space - there is no up or down, and everything is weightless. The physical behaviour of particles, liquids and cells in microgravity was the focus of ESA's activities on the International Space Station during the first weeks of February. The three astronauts from Expedition 58 living in space worked on experiments about how time perception and their biological clocks might change in space. While awaiting the arrival of three new crewmates on 14 March, the trio is carrying out a significant amount of science. The Fluidics experiment, or Fluid Dynamics in Space, observes how liquids move in weightlessness. To help in the quest to learn more, the astronauts installed hardware in the Columbus laboratory and turned on a miniature centrifuge to start the fifth science run of this experiment. Gravity on Earth means fuel settles to the bottom of a fuel tank so it is easy to ensure every drop is used. In space, fuel floats, making it more difficult to predict how it will slosh around inside a fuel tank. With Fluidics, researchers hope to understand the underlying physics of how liquids move in space so we can improve spacecraft fuel economy. One of the longest-running experiment units running on the Space Station got an upgrade earlier this month. Two Kubik units now have new electronics that will allow science teams on ground to teleoperate the equipment and check how the system is running as well as download data with just a few clicks. These features will help keep Kubik operational into its second decade of space research. 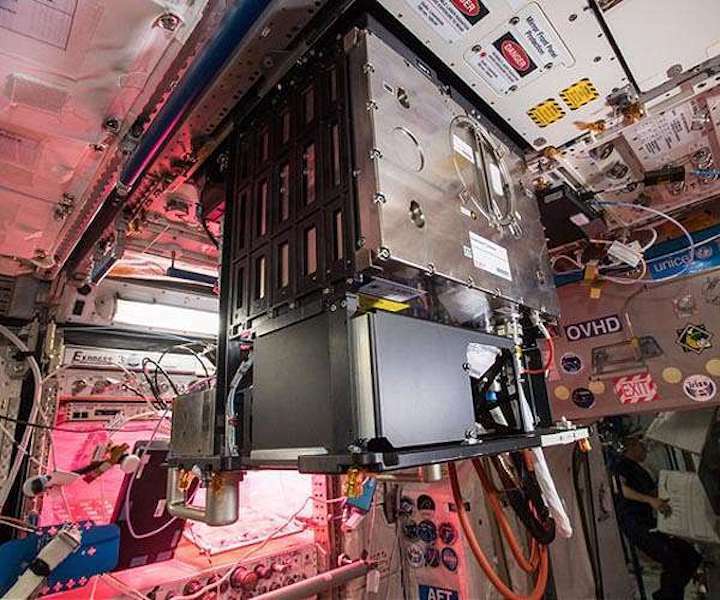 Kubik - from the Russian for cube - is a small incubator designed to run autonomously and study biological samples in microgravity. Seeds, stem cells, fungi and even swimming tadpoles have been hosted in separate tissue-box-sized units. The Fluid Science Laboratory, stationed in the Columbus module, allows researchers to study how foams, emulsions and materials behave in the absence of gravity. The Soft Matter Dynamics experiment, ran to investigate foams that are hard to study on Earth as convection destabilizes the foams. The study of foams and emulsions in weightlessness have wide practical applications. Solidified metal foams, for example, can be as strong as solid metals but are much lighter, so they are used in advanced aerospace technology and manufacturing as well as modern consumer cars. The Compacted Granulars experiment, also known as CompGran, monitored the behaviour of plastic grains until they reach complete arrest. Granular particles are far from equilibrium and lose energy when colliding with each other. Scientists carrying out this research are looking at the granular materials without the rapid sedimentation that occurs on Earth as they are unaffected by weight differences. Our bodies know roughly what time of day it is, making us feel sleepy at night. Astronauts experience 16 sunrises and sunsets every day on the International Space Station as it circles Earth, making it a unique place to study how their biological clocks cope. Long-duration spaceflights probably affect the inner clock in humans due to changes of living in light-dark cycle that does not correspond with the 24-hours of a day on Earth. NASA astronaut Anne McClain completed her third session for the Circadian Rhythms experiment that is investigating this phenomenon. For 36 hours, she wore two sensors strapped to her forehead and chest to monitor body temperature. The experiment will also measure her melatonin levels, a hormone linked to sleep. As part of the Time Perception experiment, Anne and Canadian Space Agency astronaut David Saint-Jacques wore a headset to block out external visual cues and gauged how long a visual target appears on a laptop screen. Their reaction times will help understand why and how time perception is altered in orbit.